Project Management: Theory and Practice, Third Edition gives students a broad and real flavor of project management. Bringing project management to life, it avoids being too sterilely academic and too narrowly focused on a particular industry view. It takes a model-based approach towards project management commonly used in all industries. The text begins with a background section (Chapters 1–9) containing material outside of the standard model structure but necessary to prepare students for the 10 standard model knowledge areas covered in the chapters that follow. The text is rounded out by eight concluding chapters that explain advanced planning approaches models and projects’ external environments. Recognizing that project management is an evolving field, the textbook includes section written by industry experts who share their insight and expertise on cutting-edge topics. It prepares students for upcoming trends and changes in project management while providing an overview of the project management environment today. 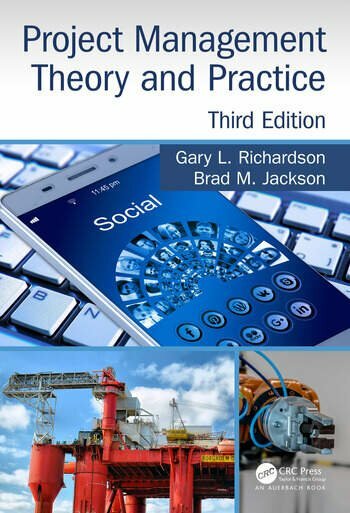 In addition to guiding students through current models and standards, Project Management: Theory and Practice, Third Edition prepares students for the future by stimulating their thinking beyond the accepted pragmatic view. Section I CONCEPTUAL OVERVIEW OF THE PROJECT ENVIRONMENT. Introduction.Evolution of Project Management. Project Management Model. Industry Trends in Project Management. Project Types. Project Organization Concepts. Project Life Cycle Management. Role of Projects in the Organization. Project Success Factors. Section II FOUNDATION PROCESSES. Project Initiation. Project Plan Development. Scope Management. Quick Start Example. Schedule Management. Cost Management. Quality Management. Section III SOFT SKILL PROCESSES. Resource Management. Project Communications. Project Stakeholder Management. High Performance Teams. Section IV SUPPORT PROCESSES. Procurement Management. Risk Management. KA Integration and Plan Completion. Section V ADVANCED PLANNING MODELS Analyzing Variable Time Estimates. Adaptive Life Cycle Models. Project Simulation. Critical Chain Model. Section VI PROJECT EXECUTING, MONITORING, AND CONTROL. Project Execution and Control. Change Management. Project and Enterprise Metrics. Earned Value Management. Tracking Project Progress. The Closing Process. Section VII PROJECT ENVIRONMENTAL SUPPORT. Organizational Maturity. Project Portfolio Management. Enterprise Project Management Office. Project Governance. Projects Responsibility and Ethical Practices. Appendix A: Financial Metrics. Appendix B: Templates. Appendix C: Project Data Repository. Gary Richardson is the PMI endowed professor of project management at the University of Houston College of Technology graduate project management program. This program serves both the internal and external professional community in regard to the theory and practice of project management. He comes from a broad professional background including industry, consulting, government, and academia.